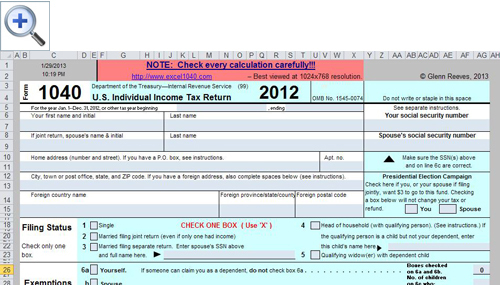 Free Spreadsheet-Based Form 1040 Available for 2012 Tax Year » Accounting Advisors, Inc.
Fresh from our pull-back from the fiscal cliff, it's not just the IRS that's been madly updating forms for the 2012 filing season. Right on schedule, Glenn Reeves of Burlington, Kansas has released his sixteenth spreadsheet-based version of the US Individual Tax Return, commonly known as Form 1040. Since 1997 Mr. Reeves has pursued this “labor of love,” which means he allows any taxpayer to download and use the spreadsheet for free.